Conowingo, MD –3-31-11 – A new website launched is launched to help Marylanders find their next golden retriever puppy without spending a fortune or driving hundreds of miles. Maryland-Golden-Retriever-Puppies.com offers free information and pictures of family-raised AKC puppies that are currently available. Visitors can visit http://www.Maryland-Golden-Retriever-Puppies.com to view the current litter and see what satisfied past clients are sharing about their beloved pets. The website describes the AKC registered parents, and also introduces the family behind the business. 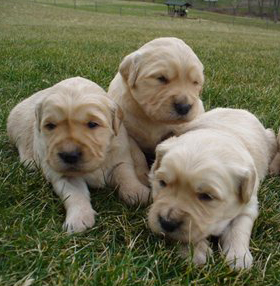 They have more than 15 years of experience breeding healthy golden retriever pups. For more information, go to http://www.Maryland-Golden-Retriever-Puppies.com. Questions can be directed to Dianna at 443-250-7871 or email: d_sgoldendelights@yahoo.com.